How could anyone in the right mind label this weekend's CRomnibus abomination "A Rare Bipartisan Success for Congress"? Apparently, that unaccountable plaudit was bestowed upon Washington by the WSJ solely because it avoided another government shutdown. And one that was of its own making at that. After all, we are already 75 days into the new fiscal year, yet Congress had not yet passed a single appropriations bill. So once again it had set itself up for the usual midnight scramble behind closed doors where the pork barrel overflows and sundry K-street lobbies stick-up the joint and then demand immediate passage-----sight unseen-----in the name of keeping the Washington Monument open on the morrow. Not only did Citigroup and the rest of the big Wall Street banks succeed in gutting the "push-out" requirements of Dodd-Frank, thereby extending their lease to gamble in the derivatives market with FDIC (i.e. taxpayer) guaranteed money. Crony Capitalism also got a huge bonanza in the form of a 10X increase in the contribution limit to party committees. Now the heavy hitters can actually give $230,000 annually to the GOP and Dem campaign committees. And this is supposed to merit praise? Yes, this game has been going on for years. But the fact that the nation's leading financial newspaper was witless enough to describe it as a "success" is something comparatively new. What has happened is that the deafening clamor from the Wall Street casino for endless winnings has subordinated all else. Even a brief government shutdown is now verboten-------not because it would have any deleterious effect in the real world where virtually 80% of domestic operations are exempted under the "health and safety" clause, anyway. No, the purported danger is that it might prompt a panicked sell-off in the stock market. This oppressive regime has been building every since the House GOP had the good sense to defeat the first TARP vote back in September 2008-----only to turn tail and approve it a few days later after Wall Street staged a monumental hissy fit. So we now have governance by the robo-traders and gamblers who light up the trading screens 24/7. Indeed, there is no evidence that the voters have ever punished elected politicians for the periodic but essentially phony "shutdowns" of Federal operations that have occurred since 2011. Indeed, the GOP did shutdown the government for an unusually long period last October, but the voters' message this November was the very opposite of retribution. On the other hand, there have been Wall Street hissy fits each and every time a shutdown loomed or happened. So now the bipartisan leaders have essentially become pavlovian lap dogs who are willing to countenance any outrage, plunder and dereliction that might be required to keep the doors open for a few more weeks or months at a time. But far from being praiseworthy, this kind of kick-the-can pandering is digging the nation into a monumental fiscal trap. Consider another more troubling measure of elapsed time. At the moment of CRomnibus' passage, we were in day 345 of CY 2014, and the cumulative deficit for that period clocked in at $700 billion. Yes, notwithstanding all of the palaver about the shrinking deficit, here we are deep into the 6th year of so-called recovery and the national debt is still being jacked-up by what only a decade ago would have been considered bottom-of-the-recession magnitudes. And here again, Washington's utter nonchalance about this dangerous condition is owning to the tyranny of the Fed's free money fueled Wall Street casino. Even after the hiccup of recent days, the market's blistering but wholly unwarranted rise has lulled both Washington and Wall Street into the same delusion that set in during the final days of the dotcom bubble and then again at the peak of the housing and credit bubble during 2006-2008. Namely, that the business cycle has been suspended or repealed by the purported magicians at the Fed, and that, accordingly, the nirvana of permanent full employment prosperity is just around the corner. Here's the skunk in the woodpile. When you drop this kind of Rosy Scenario into the budget computers and crank out the projections for another ten years, the deficit and national debt always bend toward the flat-line. Its inherent in the laws of compound arithmetic. Rosy Scenario as now embedded in the CBO projections, of course, will never materialize. CBO is currently projecting, with no embarrassment at all, that the US will go without a recession between 2009 and 2024; that 16 million new jobs will be created over the next ten years compared to 3 million during the last decade; that real GDP will grow at better than a 3% rate until we hit permanent full-employment compared to just 1.7% per year since the turn of the century; and that wages and salaries will grow at a 5.3% rate during the next decade compared to 3% during the prior 10 years. And that's just a smidgeon of the unwarranted optimism built into Washington's fiscal projections. Even then, CBO projects that the national debt will rise by $8 trillion during the next decade, notwithstanding Rosy Scenario and full-employment forever. By contrast, just "copy and paste" the last 10 years of actual economic performance, and throw in the propensity of Congress to extend at the 11th hour all of the artificially expiring tax-loopholes and incentives and future budget cuts in programs like DOD and the "doc fix" under Medicare, for example, that flatter the 10-year projections. When you make those modest accommodations to reality, in fact, you add more than $15 trillion to the national debt in the decade ahead. Stated differently, just give even partial credit to the swirling deflationary forces now besetting the world economy; or merely acknowledge that the house of cards in China is heading for some kind of landing that is not likely to be "soft"; or that the madmen running the government and central bank of Japan have ignited a deadly currency race to the bottom; or that the ECB does not remotely have "whatever it takes" to alleviate Europe's welfare state stupor. Under these "headwind" conditions, US nominal GDP is not likely to exceed $24 trillion 10 years from now, whereas the public debt could easily exceed $33 trillion under current "kick-the-can" policies. National debt at a Greek-style 140% of GDP? That's exactly where last weekend's style of "bipartisan success" is leading. Can the Fed actually print that much money? Can the Wall Street casino avoid the mother-of-all-hissy-fits if it doesn't? Perhaps one day the WSJ will be required to report the real financial news. This year’s Congress, best known for polarization and gridlock, ended with a rare bipartisan coalition staggering across the finish line, setting up a test of whether a political center could be sustained on other issues next year. 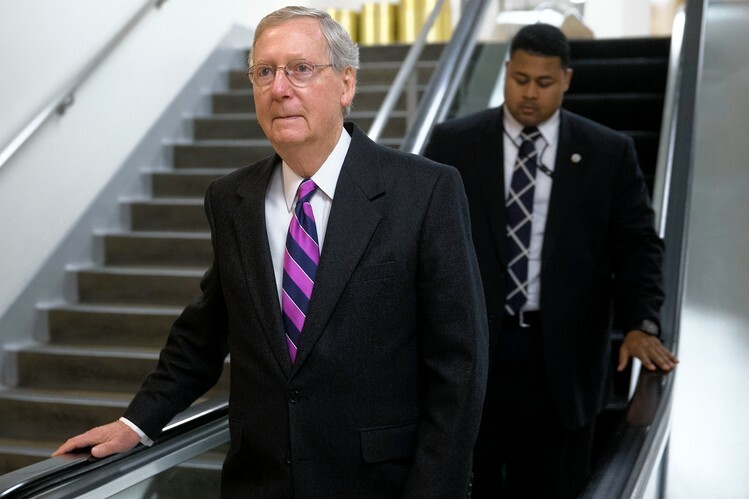 The Senate passed a $1.1 trillion spending bill late Saturday night by a 56-40 vote that crisscrossed party lines, reflecting a desire by both parties to keep the government open and end Congress’s tormented year. It also pointed to some broader political dynamics that could outlast the lame-duck session. The House had approved the spending bill two days earlier. Republican leaders in both the House and Senate shepherded the bill over the objection of their disgruntled conservative wings, an assertion of power by the party establishment after years of heckling by the back benches. Among Democrats, a majority proved reluctant to follow the party’s resurgent liberals to a confrontational year-end battle. The 56 “yes” votes comprised 31 Democrats, 24 Republicans and one independent. One wild card emerged as a potential obstacle: the pull of the next presidential campaign. All the Senate’s potential presidential candidates from both parties voted against the bill. That made for an odd alliance of potential Republicans contenders—Sens. Ted Cruz of Texas, Rand Paul of Kentucky and Marco Rubio of Florida—joined by Sens. Elizabeth Warren , a Massachusetts Democrat, and Bernie Sanders, an independent from Vermont. A powerful force propelling the spending bill was the desire to avoid a government shutdown or extend the budget debate, especially among Republicans who took a political hit when they were blamed for the 2013 shutdown. That leaves some people skeptical that the bipartisan support for this bill is a harbinger of a more conciliatory Congress. Mr. Cruz led Republicans opposed to the bill because it didn’t do more to block President Barack Obama ’s immigration policy; Ms. Warren led a charge among liberal Democrats who objected to a provision rolling back banking regulations. Neither got their way, but both built their standing among activist supporters. Mr. Cruz got most of the attention because his demand for a vote on immigration policy forced the Senate into an unexpected weekend session. He drew fire from fellow Republicans because the move created a procedural loophole that allowed Democrats to advance a long list of administration nominations to government posts. Mr. Cruz’s motion, which he cast as a referendum on the Obama policy of blocking deportation of millions of undocumented immigrants, was defeated on a 74-22 vote. Among those opposing it were the top two Senate GOP leaders, Mitch McConnell (R., Ky.) and John Cornyn (R., Texas). Among those joining Mr. Cruz were 16 Republicans up for re-election in 2016, including Sens. Rob Portman of Ohio and Roy Blunt of Missouri. The measure provides funding for most of the federal government until Sept. 30, 2015, the end of the fiscal year. It funds the Homeland Security Department only through February, a move designed to give Congress another crack at curbing the Obama immigration policy after Republicans take the majority of both the House and Senate next month. The banking provision that revises the Dodd-Frank financial regulations would loosen a requirement that banks transfer some of their riskiest trading activities into affiliates that can’t use federal backstop programs such as deposit insurance. Even though the transfer of majority power to the GOP doesn’t take place until January, the lame-duck session showed early signs that the tea-party wing of the GOP is waning in influence as the party prepares to take more responsibility for running the government. Some of the divisions among Senate Democrats reflect their own transition to the minority, in particular a lively debate over what kind of minority party they should be. Ms. Warren, who is pushing a more populist economic policy, was joined in opposition to the spending bill by 20 other Democrats and one independent, most of them liberals. Sen. Chuck Schumer, Senate Democrats’ No. 3 leader, argued the divisions among Democrats heading into 2015 aren’t as fundamental as the split among Republicans. “On the fundamental issues that face us, the economic issues that we need to address to get the middle class moving again, to get middle-class incomes going again, there’s amazing unity on the Democratic side,” Mr. Schumer said Sunday on CNN. Some Republicans contend that Mr. Cruz and Ms. Warren would have less leverage if Congress didn’t leave all spending bills to one big last- minute package, an invitation to brinkmanship and a practice Senate Republicans promise to try to avoid.